Dive into the 8051 Microcontroller's program memory and see how your compiled program hex code resides; - byte by byte. "It is a very effective tool, easy to understand and decode hex files. It saves my time." Make sense out of 8051 microcontroller's compiled Hex Code. 8051 Disassembler / Decompiler is a Windows application that can take your 8051 Microcontroller Program Binary in HEX format. Then it can parse and give you a complete picture of how the program resides in the Program memory byte by byte. It gives you Assembly Code with tooltip and visual annotation like which code is going to the Special Function Register, which one is the interrupt vector etc and lots of rich information. By looking into the decompiled rich annotations, you will get the intuition about the compiled hex code. 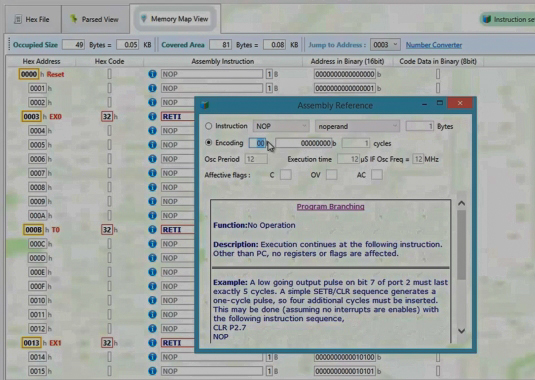 Not only the tooltip and graphical annotation, anytime you want to know details about a decompiled/disassembled instruction, simply click the Info button and the Assembly language reference window will pop up and take you to the referenced assembly code. The 8051 Disassembler generates 2 perspectives for the same decompiled Hex Code. One is called "Memory Map View and another is called simply "Parsed View". 8051 Disassembler is not just a decompiler or disassembler. Rather it is designed mainly to aid learning the 8051 Instruction Set and Assembly language. Therefore, you will find lots of annotation and tooltips here and there to get more information about the data. Here is a tooltip example. You will also learn about Interrupt vectors, Special function registers etc simply by placing your mouse over a decompiled instruction code. The special color coding will also help you to learn the things intuitively. This application can be used to decode INTEL's 8051 families 8-bit Microcontrollers which can access at most 64KB of code memory. Finally, it will really help you to realize the exact picture of how your instruction set will stay physically in the code memory. The 8051 Disassembler is natively made for Windows Desktop. The modern user interface and intuitive user experience is something you may like to check out. This software is limited to only '16 bit address' data records. Therefore, it should not be used for decoding hex code that contains Extended Segment Address Record or Extended Linear Address Record.